Energy bills soon stack up and if you are on a tight budget, you won’t want to have the central heating on 24-7. Luckily there are lots of relatively inexpensive ways to keep warm at home during the colder months. So if you are trying to reduce your household expenditure, here are a few tips to help you stay warm without running up big bills. Sitting around doing nothing is not much fun when it’s cold. You need to move around in order to stay warm, so if your home is a bit on the cool side, try and stay active as much as possible. This doesn’t mean you should start jogging around the garden in sub-zero temperatures, but a session of vigorous housework will soon get the circulation moving and warm you up. Your house will also look a lot cleaner! 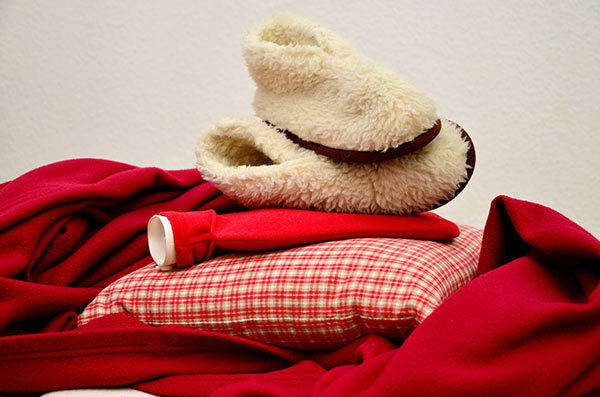 If you are feeling cold, the simplest way of warming up is to throw on a few more layers. After all, you wouldn’t go on a polar expedition wearing a thin sweater and some jeans, would you? No, of course you wouldn’t. Wearing lots of layers is the best strategy. That way you can peel off a couple if you warm up as a result of all the housework we have advised you to do. Think like a sports person: the layers next to your skin should be breathable and capable of wicking moisture away from your skin. Natural fibers such as cotton are best. An awful lot of heat is lost through windows, particularly if your windows are old and drafty. Modern double-glazing keeps the heat much better, but if you don’t have double-glazing, hang some thick drapes and close them as soon as the light fades. This will help to insulate your room and keep the heat in. It’s pointless wasting money heating rooms you never use. This is especially true in larger homes with few occupants. Guest bedrooms and unused living rooms remain empty and heat is wasted. To save money, close off rooms you don’t use and only heat the rooms you live in on a day-to-day basis. Do keep a close eye on them, however, to avoid any damp issues. Open fires and log burners are an excellent way to heat a home for very little. Most people have lots of bits of wood lying around they can burn. You could order a firewood delivery from the Premier Firewood Company, and you could also ask around local businesses to see if they have any old pallets or scrap timber they don’t need? All you need to do is spend an afternoon chopping firewood and kindling and you will have plenty of fuel for your fire on colder days. There is another way to keep warm, but it involves getting cozy with your other half, and if you can’t stand the sight of each other this handy method won’t be palatable to either of you.